Want to hear Ariana Grande talk about Ricky, Sean, Mac, and yes- Pete? Ricky Alvarez and Big Sean each got to listen to “thank u, next” early, according to Ariana Grande. Hours before Saturday Night Live‘s Nov. 3 episode aired on NBC, the pop star surprised fans by releasing a new song that directly addressed her famous former flames. Given that the song was seemingly written after Ariana ended her whirlwind engagement to Pete Davidson Oct. 14, it seems unlikely her ex Mac Miller was able to hear the track before his death Sept. 7. AND PS…. 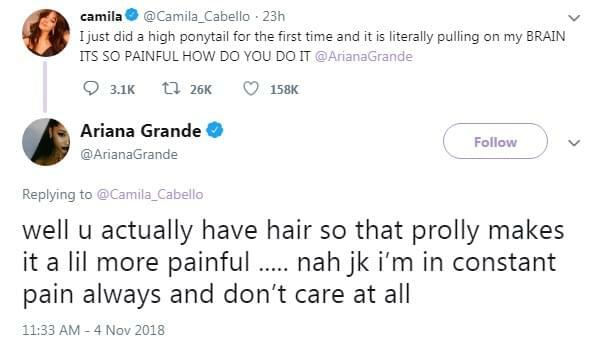 Her high pony tail hurts just like yours does.